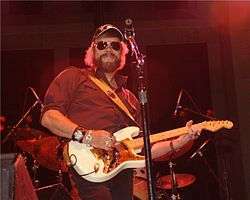 Randall Hank Williams (born May 26, 1949), known professionally as Hank Williams Jr., is an American singer, songwriter and musician. His musical style is often considered a blend of Southern rock, blues, and traditional country. He is the son of legendary country music singer Hank Williams and the father of Hank Williams III, Holly Williams, Hilary Williams, Samuel Williams, and Katie Williams. Williams began his career by following in his famed father's footsteps, singing his father's songs and imitating his father's style. Williams's own style slowly evolved as he struggled to find his own voice and place within the country music industry. This trend was interrupted by a near-fatal fall off the side of Ajax Peak in Montana on August 8, 1975. After an extended recovery, he challenged the country music establishment with a blend of country, rock, and blues. Williams enjoyed much success in the 1980s, from which he earned considerable recognition and popularity both inside and outside the country music industry. As a multi-instrumentalist, Williams's repertoire of skills include guitar, bass guitar, upright bass, steel guitar, banjo, dobro, piano, keyboards, harmonica, fiddle, and drums. From 1989 until October 2011, a version of his song "All My Rowdy Friends Are Coming Over Tonight" was used as the opening for broadcasts of Monday Night Football. Williams was born on May 26, 1949 in Shreveport, Louisiana. His father nicknamed him Bocephus (after Grand Ole Opry comedian Rod Brasfield's ventriloquist dummy). After his father's untimely death in 1953, he was raised by his mother, Audrey Williams. While he was a child, a number of contemporary musicians visited his family, who influenced and taught him various music instruments and styles. Among these figures of influence were Johnny Cash, Fats Domino, Earl Scruggs, Lightnin' Hopkins, and Jerry Lee Lewis. Williams first stepped on the stage and sang his father's songs when he was eight years old. In 1964, he made his recording debut with "Long Gone Lonesome Blues", one of his father's many classic songs. Williams provided the singing voice of his father in the 1964 film Your Cheatin' Heart. He also recorded an album of duets with recordings of his father. By the mid-1970s Williams began to pursue a musical direction that would eventually make him a superstar. While recording a series of moderately successful songs, Williams began a heavy pattern of both drug and alcohol abuse. Upon moving to Alabama, in an attempt to refocus both his creative energy and his troubled personal life, Williams began playing music with Southern rock musicians including Waylon Jennings, Toy Caldwell, and Charlie Daniels. Hank Williams Jr. and Friends (1975), often considered his watershed album was the product of these then-groundbreaking collaborations. In 1977 Williams recorded and released One Night Stands and The New South, and worked closely with his old friend Waylon Jennings on the album Once and For All. On August 8, 1975 Williams was nearly killed in a mountain-climbing accident. While he was climbing Ajax Peak in Montana, the snow beneath him collapsed and he fell almost 500 feet onto rock. He suffered multiple skull and facial fractures. The incident was chronicled in the semi-autobiographical, made-for-television film Living Proof: The Hank Williams Jr. Story. He spent two years in recovery, had to have several reconstructive surgeries and had to learn to talk and sing again. To hide the scars and the disfigurement from the accident, Williams grew a beard and began wearing sunglasses and either a cowboy hat or baseball cap. The beard, hat, and sunglasses have since become his signature look, and he is rarely seen without them. Williams's career began to hit its peak after the Nashville establishment gradually—and somewhat reluctantly—accepted his new sound. His popularity had risen to levels where he could no longer be overlooked for major industry awards. He was prolific throughout the 1980s, sometimes recording and releasing two albums a year. "Family Tradition", "Whiskey Bent and Hell Bound", Habits Old and New, Rowdy, The Pressure Is On, High Notes, Strong Stuff, Man of Steel, Major Moves, Five-O, Montana Cafe, and many others resulted in a long string of hits. Between 1979 and 1992, Williams released 21 albums, 18 studio & 3 compilation, that were all, at least, certified gold by the RIAA. Between 1979 and 1990, Williams enjoyed a string of 30 Top Ten singles on the Billboard Country charts, including eight No. 1 singles, for a total of 44 Top Ten singles, including a total of 10 No. 1 singles, during his career. In 1982, he had nine albums simultaneously on the Billboard Top Country Albums chart, all of which were original works and not compilations. In 1987 and 1988, Williams was named Entertainer of the Year by the Country Music Association. In 1987, 1988, and 1989, he won the same award from the Academy of Country Music. The pinnacle album of his acceptance and popularity was Born to Boogie. During the 1980s, Williams became a country music superstar known for catchy anthems and hard-edged, rock-influenced country. During the late 1970s and into the mid-1980s, Williams's songs constantly flew into the number one or number two spots, with songs such as "Family Tradition", "Whiskey Bent and Hell Bound", "Old Habits", "Ain't Misbehavin'", "Born to Boogie", and "My Name Is Bocephus". The 1987 hit single Wild Streak was cowritten by Houston native Terri Sharp, for which Williams and Sharp both earned gold records. In 1988 he released a Southern pride song, "If the South Woulda Won". The reference is to a Southern victory in the Civil War. The song proposes a southern holiday honoring Elvis Presley. Williams would run for president of the South. He would place the capital in Montgomery, Alabama, honoring his father, Hank Williams, Sr., with his image on the $100 bill. He also implies that in the current United States killers frequently get off too easily and calls for swift executions instead. His 1989 hit "There's a Tear in My Beer" was a duet with his father created using electronic merging technology. The song was written by his father, and had been previously recorded with Hank Williams playing the guitar as the sole instrument. The music video for the song combined existing television footage of Hank Williams performing, onto which electronic merging technology impressed the recordings of Williams, which then made it appear as if he were actually playing with his father. The video was both a critical and commercial success. It was named Video of the Year by both the Country Music Association and the Academy of Country Music. Williams would go on to win a Grammy Award in 1990 for Best Country Vocal Collaboration. He is well known for his hit "A Country Boy Can Survive" and as the performer of the theme song for Monday Night Football, based on his 1984 hit "All My Rowdy Friends Are Coming Over Tonight". In 1991, 1992, 1993, and 1994, Williams's opening themes for Monday Night Football (Written by ghost writer Milliea Taylor McKinney known for selling her song rights to artists) the tune earned him four Emmy Awards. In 2000, he provided the voice of Injun Joe in Tom Sawyer. In 2001, Hank co-wrote his classic hit "A Country Boy Can Survive" after 9/11, renaming it "America Can Survive". In 2004, Williams was featured prominently on CMT Outlaws. In 2006, he starred at the Summerfest concert. He has also made a cameo appearance along with Larry the Cable Guy, Kid Rock, and Charlie Daniels in Gretchen Wilson's music video for the song "All Jacked Up". He and Kid Rock also appeared in Wilson's "Redneck Woman" video. Hank also had a small part of Kid Rock's video "Only God Knows Why", and "Redneck Paradise". He is also referenced in numerous songs by modern-day country singers, including Kid Rock, Brantley Gilbert, Gretchen Wilson, Alan Jackson, Justin Moore, Trace Adkins, and Aaron Lewis. In April 2009, Williams released a new single, "Red, White & Pink-Slip Blues", which peaked at number 43 on the country charts. The song was the lead-off single to Williams's album 127 Rose Avenue. The album debuted and peaked at number 7 on the Billboard Top Country Albums chart. Also in July 2009, 127 Rose Avenue was announced as his last album for Curb Records. On April 10, 2006, CMT honored Williams with the Johnny Cash Visionary Award, presenting it to him at the 2006 CMT Music Awards. On November 11, 2008, Williams was honored as a BMI Icon at the 56th annual BMI Country Awards. The artists and songwriters named BMI Icons have had "a unique and indelible influence on generations of music makers." In 2011, Williams was named one of "Five Living Legends" of his native Shreveport, Louisiana, by Danny Fox (1954–2014) of KWKH radio. Others named were Bob Griffin of KSLA and KTBS-TV and James Burton. Two other cited, Claude King and Frank Page, both died in 2013. Williams has been politically involved with the Republican Party. For the 2000 election, he redid his song "We Are Young Country" to "This is Bush–Cheney Country". On October 15, 2008, at a rally in Virginia Beach for Republican presidential nominee John McCain, he performed "McCain–Palin Tradition", a song in support of McCain and his vice presidential nominee Sarah Palin. He has made many contributions to federal election campaigns, mostly to Republicans, including Michele Bachmann's 2012 presidential campaign. In November 2008, Williams explored a run for the 2012 Republican nomination as a U.S. Senator from Tennessee for the seat held by Bob Corker, though his publicist said Williams "has talked about it, but no announcement has been made". Williams did not run, and Corker was easily reelected to a second term. In an October 3, 2011, interview with Fox News Channel's Fox & Friends, Williams referred to a June golf game in which President Barack Obama and Republican House Speaker John Boehner had teamed against Vice President Joe Biden and Ohio Governor John Kasich, saying that match was "one of the biggest political mistakes ever". Asked about why that golf game disturbed him, Williams said, "Come on. That'd be like Hitler playing golf with Netanyahu ... in the shape this country is in?" He also stated the President and Vice President are "the enemy" and compared them to "the Three Stooges". When anchor Gretchen Carlson later said to him, "You used the name of one of the most hated people in all of the world to describe, I think, the president." Williams replied, "Well, that is true. But I'm telling you like it is." As a result of his statements, ESPN dropped Williams' opening musical number from its Monday Night Football broadcast of the Tampa Bay Buccaneers versus the Indianapolis Colts and replaced it with the national anthem. Later, Williams stated his analogy was "extreme – but it was to make a point", and "Some of us have strong opinions and are often misunderstood ... I was simply trying to explain how stupid it seemed to me – how ludicrous that pairing was. They're polar opposites, and it made no sense. They don't see eye-to-eye and never will." Williams went on to claim he has "always respected the office of the president ... Working-class people are hurting – and it doesn't seem like anybody cares. When both sides are high-fiving it on the ninth hole when everybody else is without a job – it makes a whole lot of us angry. Something has to change. The policies have to change." ESPN later announced they were "extremely disappointed" in Williams' comments, and pulled his opening from that night's broadcast. Three days later, ESPN released a statement announcing Williams and his song would not return to Monday Night Football, ending the use of the song that had been part of the broadcast on both ABC and ESPN since 1989. Williams has further expressed defiance and indifference on his website, and said he was the one who made the decision. "After reading hundreds of e-mails, I have made MY decision," he wrote. "By pulling my opening Oct 3rd, You (ESPN) stepped on the Toes of The First Amendment Freedom of Speech, so therefore Me, My Song, and All My Rowdy Friends are OUT OF HERE. It's been a great run." Williams' son, Hank Williams III, stayed neutral in the debate, telling TMZ.com that most musicians, including his dad, are "not worthy" of a political discussion. After his song was pulled from Monday Night Football broadcasts permanently, Williams recorded a song criticizing President Obama, ESPN and Fox & Friends titled "Keep the Change". He released the track on iTunes and via free download at his website. The song garnered over 180,000 downloads in two days. Williams continues to make his opinions of President Obama known; during a performance at the Iowa State Fair in August 2012 he called Obama a Muslim and told the crowd, "We've got a Muslim president who hates farming, hates the military, hates the U.S. and we hate him!" 1 2 Hank Williams Jr. – Official Website Archived July 16, 2011, at the Wayback Machine. ↑ Buchalter, Gail (October 22, 1979). "Hank Williams Jr. Fell Down a Mountain and Lived Now He's Climbing High on the C&w Charts". People.com. 12 (17). Retrieved August 3, 2013. ↑ "The Fall". Country Music Hall of Fame. Retrieved August 3, 2013. ↑ "Hank Williams dropped from Monday Night Football - Richard Deitsch - SI.com". Sportsillustrated.cnn.com. October 6, 2011. Archived from the original on November 11, 2011. Retrieved 2011-11-27. ↑ "ESPN pulls Williams from MNF opening". ESPN.com. October 4, 2011. ↑ "Your Cheatin' Heart". December 1, 1964 – via IMDb. ↑ "Hank Williams visits W.Va. mine survivor". USA Today. January 11, 2006. ↑ Morris, Edward (July 21, 2009). "Hank Williams Jr. says new album is his last for Curb Records". Country Music Television. Retrieved 2009-07-24. ↑ "Hank Williams, Jr. to be Honored as Icon at 56th Annual BMI Country Awards". bmi.com. Retrieved 2010-10-05. ↑ "McCain–Palin Tradition" Archived February 6, 2009, at the Wayback Machine. ↑ "Hank Williams Jr. – Federal Campaign Contribution Report". Newsmeat.com. Retrieved 2011-11-27. ↑ "Hank Williams Jr. For Senate? - Real Clear Politics – TIME.com". Realclearpolitics.blogs.time.com. November 25, 2008. Archived from the original on January 28, 2012. Retrieved 2011-11-27. ↑ "ESPN pulls Hank Williams Jr. intro after singer links Obama with Hitler". Sportsillustrated.cnn.com. October 3, 2011. Archived from the original on November 13, 2011. Retrieved 2011-11-27. ↑ "ESPN, Hank Williams Jr. part ways". ESPN.com. October 6, 2010. ↑ "ESPN – Hank Williams Jr. theme song won't return to Monday Night Football – ESPN". Espn.go.com. October 6, 2011. Retrieved 2011-11-27. ↑ "Hank Williams Jr.'s Son – My Dad Should NOT Talk Politics". TMZ.com. November 22, 2011. Retrieved 2011-11-27. ↑ Weir, Tom (October 10, 2011). "Hank Williams Jr. retaliates with song that slams Fox". USA Today. ↑ "Hank Williams Jr. Thrives With Downloads, Media Coverage Surrounding Controversy". CMT News. October 12, 2011. ↑ "Country Star Calls Obama 'a Muslim'". ABC News. August 20, 2012. Wikimedia Commons has media related to Hank Williams, Jr..